Guitarist/Singer, Gary Small was awarded "Best Songwriter" for his recent Native American release "Wild Indians" at the Fifth Annual Native American Music Awards held at the Marcus Amphitheatre in Milwaukee, Wisconsin on Saturday. Small also garnered nominations in the "Best Male Artist" and "Best Blues/Jazz Recording" categories. Small also performed at the Awards show with other celebrities: Crystal Gayle, Felipe Rose (Village People) and Grammy Award winners, Verdell Primeaux, and Johnny Mike. Small is a tribal member of the Northern Cheyenne Tribe whose reservation is located in remote southeastern Montana. His new CD is a powerful blend of his masterful vocal like guitar coupled with powerful songwriting, regarding the many facets of this country's indigenous peoples. Small's percussion laden band is based out of Portland Oregon and contains such notables as percussionist, Graham Lear, a 12-year alumnus of Santana. "...Small's guitar playing so reminiscent of Carlos Santana it's stunning. In fact it wouldn't be unfair to say Small could become the Santana of Native American music-translating his history through myriad musical forms in a way that speaks on several levels." 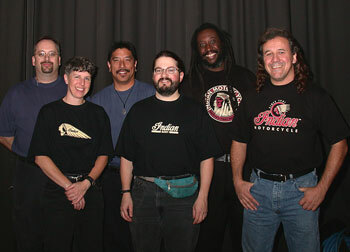 (L to R) Ward Griffiths (Percussion), Caton Lyles (Percussion), Gary Small (Guitar/Vocal), Art Viloria (Guitar), Ronaldo Solomon, (Keys) Former Santana Great, Graham Lear (Percussion), Scott Portzline (Bass). 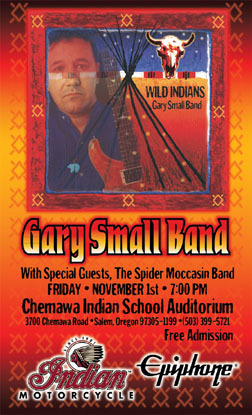 Chemawa Indian School Auditorium was rocking to Native roots rock group, "The Gary Small Band", Friday November 1st . 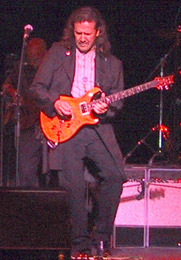 Gary Small, a member of the Northern Cheyenne Tribe is the 2002 award recipient of the Native American Music Awards, "Songwriter of the Year" award for his latest CD release "Wild Indians". 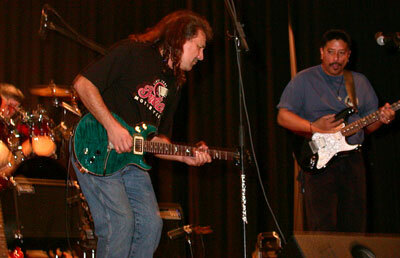 Opening the concert was another Native American rock group, The Spider Moccasin Band. The concert was to benefit the Chemawa Indian School music program efforts. Guitars, basses and amplifiers ware donated to the school during the concert. Actor/Musician Branscombe Richmond/Indian Motorcycles, Gibson/Epiphone Guitars, Apple Music, Friends of Guitar Players Anonymous and the Gary Small Band made generous donations towards the musical equipment donation. The concert was attended by various health related projects representatives from the Northwest Portland Area Indian Health Board. Chemawa Indian High School is one of the four remaining Off-Reservation Boarding Schools operated by the Bureau of Indian Affairs, which offers secondary education to eligible Indian and Alaska Natives. The school founded in 1880 has served over 30,500 students during its 121-year history as the oldest continuously operating Indian boarding school. Typically Chemawa students represent more than sixty tribes and come from seventeen states. The majority of the students are from the Pacific Northwest. "My father was taken to the Genoa Indian Boarding School in Nebraska, at age 7 in 1922", says guitarist Gary Small. "In those days Indian Boarding Schools were not a pleasant experience. In those days the goal of the government was to beat the Indian out of you. Thanks to brave individuals, we have persevered and people like Principal Miguel Reyes is showing our students how to succeed in life and simultaneously preserve to our Indian heritage with pride and dignity. How can I not be a part of something like that?" Above, Gary signing donated copies of "Wild Indians" to Students. Left and below, laying down the tune with a Paul Reed Smith and one cool Indian Motor Cycle Tee shirt, compliments of Indian Motorcycles. Above: Gary and Principal Miguel Reyes in front of donated guitars courtesy: Gibson/Epiphone, Apple Music, Friend of Guitars Anonymous, Indian Motorcycles and the Gary Small Band. L-R: Toby Worthington (Bass) Ward Griffiths (Drums) Art Villoria (Guitar-Vocal) Ronaldo Solomon (Keys) Caton Lyles (Congas) Gary Small (Guitar-Vocal) showing off the latest in Indian Motorcycle aparel.